Years ago, I was a coffee addict. As soon as I woke up, there was a cup of coffee in my hand. Two cups usually did the trick, but occasionally, there was a need for a third. Since that time, I cut out caffeinated coffee (most of the time) and I, now, stick to a cup of decaf, when I am in the mood. I never stopped loving the taste of coffee, but I was finding that the caffeine was doing a number on my sleep cycle. Funny thing is, I can eat a pound of chocolate just before bedtime and sleep like a baby; but let someone give me a cup of decaf in the afternoon and I will be blasting that person’s name out loud at 2:00 in the morning. Regardless of when one enjoys coffee, it is always lovely to have a cookie along with the drink. Doesn’t have to be sweet; just has to be satisfying. Last week happened to be a heavy coffee drinking week for me. Being a creature of habit, I got to work right away on baking Toasted Almond Cookies, and couldn’t help but think of the childrens’ book, “If You Give A Mouse A Cookie” by Laura Joffe Numeroff. The premise is that if you give a mouse a cookie, he will want some milk, which will lead to something else, until finally the mouse gets back to wanting a cookie. Oh how I relate! The toasted almonds are chopped, or in my case beaten with a rolling pin, and then mixed into the dough. After the dough is formed into logs, it is refrigerated several hours or overnight. When ready, l have slice and bake cookies. The dough freezes, beautifully; I will often slice one of the logs and then freeze the other two, wrapping them well in plastic wrap and a freezer bag. This way I know that when a major coffee craving hits me, I will be prepared. And I do not even need a mouse to remind me of what it is that I want with my coffee. Whisk the flour, baking soda, salt and cinnamon together in a bowl. Set aside. Combine the eggs, brown sugar and sugar in a mixing bowl. Mix on medium speed for 2 minutes. Add the melted butter and vanilla and mix well. Add the flour, baking soda, salt and cinnamon and mix on low speed until well blended. Lastly, add the chopped almonds. Divide the dough into thirds and place on separate pieces of wax paper. Roll each into a log shape. Wrap each third up and refrigerate for several hours or overnight. Combine the turbinado sugar and cinnamon in a small bowl. Set aside. Unwrap the logs, one at a time, cut the dough into just under ½“ thick slices and place on parchment lined baking sheets. Sprinkle the sugar/cinnamon over each cookie. Bake at 350° oven for 13 to 15 minutes, rotating the pans top to bottom and front to back halfway through. The tops will be a nutty brown color. Cool on the baking sheets. I like to use any extra tubinado sugar/cinnamon to add to a cup of coffee and/or top pancakes with. So many possibilities. These cookies are just perfect to serve, when you need that something sweet but not too sweet. 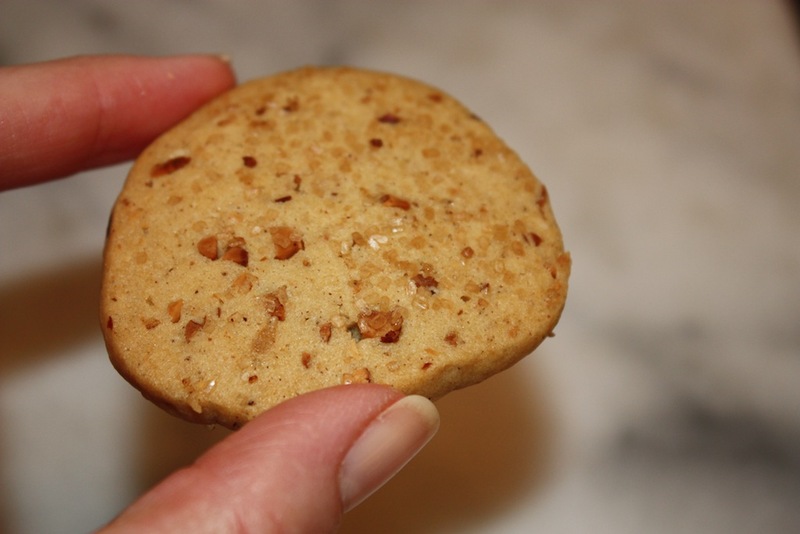 The combination of cinnamon and brown sugar within the cookie, itself, give it just the right amount of sweetness to satisfy your craving; add to that the toasted almonds and you have a crunchiness that would top off the whole eating experience, if it weren’t for just one more bonus: the turbinado sugar and cinnamon on the top. That leaves you saying, “Wow,” for a simple cookie, these are amazing.” Thanks for adding it to my repertoire. Thank you M. for your feedback!